Many families have a mythic-like figure in their family tree, the one about whom the most stories are recounted and words remembered. In my family, that figure is Benjamin “Bunny” Bornstein z”l, or as I knew him for nine short years of childhood until his death at age 79, Papa. My Papa was born in 1907 in Auburn, Maine, where he lived most of his life. He was married to Bertha Arenstam z”l (1910-1985), and together they begot four children: Faith, Lisa, Rachel and Michael, my father. Baffled, but still unwilling to refer to Papa as Bunny, the teacher told him to chose an English name that he liked. At the time the class was learning about Benjamin Franklin. Papa liked the name, and as the saying goes, the rest is history. Bunny may have been a term of endearment for a cute little baby, but it turned out to be a rather apt epithet as well. Papa grew up to be a star athlete, excelling at football at Bates College (Class of 1931) where he was widely known for his speed and agility. Papa played several positions, including quarterback, and was frequently written up in the college and local papers for his dazzling footwork on the field. What made his athletic dominance truly spectacular, though, was his size, something that even caught the attention of Ripley’s Believe It or Not. You see, Papa played varsity football, and played it very well, weighing just over 100 pounds. This site, though, is not about Papa’s athleticism. This site is about the legacy of Papa’s words. I did not appreciate it at the time, but I grew up during the years when my father was learning to live without his. 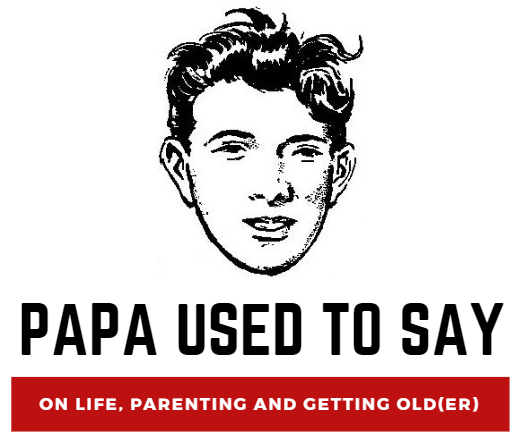 It was during these years that so often I would hear my father say “Papa used to say….” as a formulaic opening to the provision of paternal advice. I once asked my father why he framed advice in this way. Why not just tell me the advice without preface? “Because it’s how I keep Papa with me,” he said. And now, with three children of my own, I find that I too have an increasing tendency to say, “Papa used to say” as I’m helping to explain the world and its complexities to curious but often vexed young minds. It is in the spirit of my Papa, and my father’s commitment to his memory, that I will record on this blog a few of my own memories and reflections on life, parenting and getting older. Some will be serious. Some will be sarcastic and flip. All will be from the heart. And perhaps one day my children, who now know my father as their Papa, will find themselves understanding the world a little better with the help of what Papa, and I, used to say.